​​​It's easy to get bogged down in the details. Need a quick way to see the big picture? "What Does 1 Corinthians 11 Say?" Confused by what Paul says about headcovering? This graphic provides a visual layout of his explanation. "Why Are You Wearing A Headcovering?" 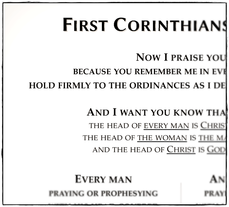 Here's a quick summary of Paul's five reasons for the headcovering, straight from 1 Corinthians 11. Follow along as the main interpretive questions of 1 Corinthians are presented in flowchart format. Quotes from famous Christians throughout history. For further historical insight, get the book. 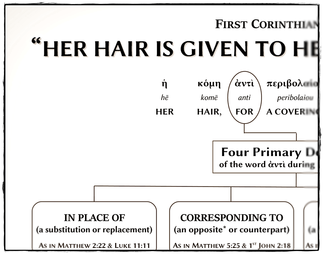 ﻿"﻿﻿Her Hair Is Given For A Covering​"
This phrase is found in First Corinthians 11:15. It has often been a source of confusion & debate. Here's a careful look at what it means. "The Heart of Headcovering" (infographic)﻿"
If headcovering is a symbol, then what does the symbol point to?